The conclave will conclude on January 31. Protective services — such as the Army, Border Security Force, Delhi Police and Air Force — are the most popular draws at the career conclave being held for Class XII students of all Delhi government schools. This is the second such conclave being organised by the education department; the first was held in May 2018. According to department officials, the stalls for these services were the most popular last year as well. On the basis of popular demand by students last year, some new options have been introduced this time. According to a department official, the field in which guidance was most heavily demanded last year was hotel management. This year, stalls by the Delhi Institute of Hotel Management and Catering Technology were introduced. 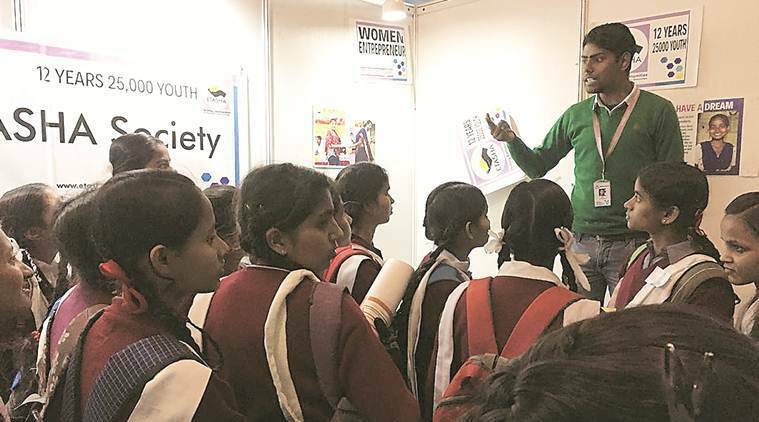 Another new addition this year was a stall by the State Council of Educational Research and Training (SCERT) after it was found that a large number of students were interested in teaching. There was also a stall by the Institute of Chartered Accountants of India after demands were raised for guidance on chartered accountancy by commerce students.“This year, a new demand we have been receiving from students is that IITs be invited to put up stalls,” said an official from the EVGC branch of the education department. The largest number of stalls at the conclave are from technical and vocational institutes such as Indira Gandhi Delhi Technical University for Women, International Polytechnic for Women, Arth Institute, Tech Mahindra SMART Academy for Healthcare, Vivo Healthcare Institute and Ambedkar University’s School of Vocational Studies. Delhi University had set up stalls from a narrow range of institutes — the School of Open Learning, Institute of Home Economics, and Swami Shraddhanand College. While there was no stall relating to its honours programmes in other regular colleges, the university’s Dean of Students’ Welfare addressed a limited group of students on courses offered and the admission process on Tuesday. Other varsities which have put up stalls are Ambedkar University, Guru Gobind Singh Indraprastha University and IGNOU.“We do give priority to inviting vocational programmes because very few students from government schools go on to pursue higher education. We can only invite a limited number of stalls. We will analyse the feedback from students, which will be taken into consideration for invitations next year,” said the official. This conclave comes after personality and aptitude tests of all Class XII students were conducted in these schools. However, only 32,000 ‘meritorious’ students from across all schools can attend due to “limited capacity”. The conclave started on January 28 and will conclude on January 31.